Explore your magazines to read online. Do you publishers want to find out a new way to release your magazines with instead of printing and delivering? Did you ever want to use a program to help you build digital magazines automatically instead of manually creating? If you follow publishing industry trends, if you are curious about new magazine publish technology, 3D PageFlip provides a green and magic way to experience the magazines. 1. Multimedia Publications: exactly retain the same content and layout in the printed magazine you get, plus stunning Flash effect, audio, background, logo and active links. 4. Profit-making Publishing: publishers can make more money by selling such things as circulation, ads, links and surveys in digital magazines. 3DPageFlip Standard (for PDF), 3DPageFlip Lite (freeware for TXT), 3DPageFlip for Photographer, 3DPageFlip for OpenOffice (freeware), 3DPageFlip for Photo (freeware). 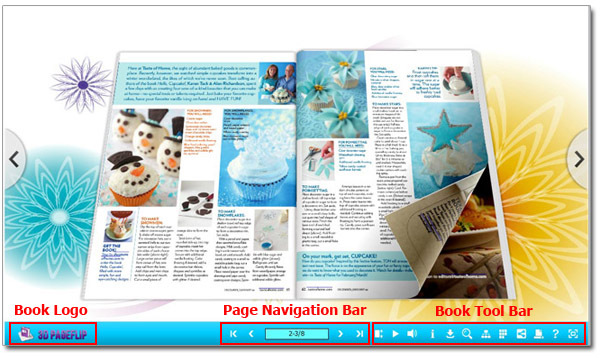 Use 3D PageFlip tools to publish a digital magazine to impress your audience online without much cost, time or effort, no matter you want to build with printed magazines or the ones created especially for the Internet. Just import your file, define brochure settings, then output into "*.html" format for sharing online instantly.